A senior Ugandan nurse has been suspended after being caught on camera complaining to a presidential candidate about poor facilities at her hospital. Adong Santina walked opposition candidate Kizza Besigye around the hospital in a remote area on Saturday. Government official Moses Kaziba Nandhala informed her that she would be disciplined for divulging "unauthorised information", a leaked letter shows. In April, Mr Nandhala failed to account for money allocated for health. The records had been eaten by termites, he said, when appearing before the parliamentary accounts committee to explain what happened to about $250,000 (£165,000) meant for health in Abim district in the north-eastern Karamoja region. The BBC's Patience Atuhaire in the capital, Kampala, says she understands that three nurses who worked at the district hospital have been suspended, although she has only seen the letter sent to Ms Santina, the senior nursing officer. Ms Santina told Mr Besigye, in the presence of television crew covering his campaign, that the hospital was operating without a qualified doctor. Another nurse said they had no power at all and water had to be fetched. The nurses are trying to appeal against their suspension, our correspondent adds. 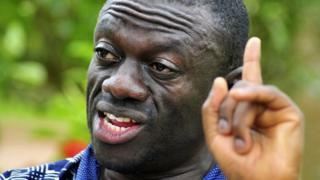 Mr Besigye, 59, is running against President Yoweri Museveni, 70, in elections due next year. He was once Mr Museveni's doctor and political ally. The president has governed Uganda since 1986, and his critics say he has become increasingly repressive.